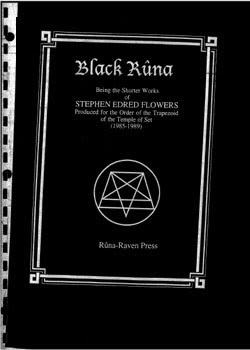 Eighteen articles originally written for Runes, the journal of the Order of the Trapezoid. This work goes a long way toward demonstrating the character of symbolic and magical work within the Order. Includes a discussion of The Command to Look, Mortensen's analysis of visual imagery and impact, the source for Anton LaVey's formulation of the Law of the Trapezoid. This limited edition (504 copies) includes some of the inner documents of the Order of the Trapezoid.